Roman Nose State Park is open year-round. Some activities within the park are only available seasonally. Inquire with the Lodge Office (800-892-8690) or the General Store (580-623-7750) for dates and hours of operation. The public pool is open seasonally from late May through early August. Please call ahead, as the hours may vary. Roman Nose State Park, named after a Cheyenne chief, is one of the original seven Oklahoma state parks. Set amidst a beautiful canyon, gypsum rock cliffs and three natural springs, recreational activities at this state park include an 18-hole golf course, swimming pools, hiking trails, two lakes, trout fishing in season, canoeing, paddle boats, mountain biking, horse stables and hayrides by reservation. Rentals include canoes, kayaks, paddleboats and mountain bikes. Swimming in the lakes is not allowed, but fishing and no-wake boating are welcome. For a truly memorable stay, book a night at the beautiful Roman Nose State Park Lodge. The 22-room lodge, originally constructed in 1956, has been completely renovated to reflect the natural landscape of the area. The reconstruction emphasizes the lodge's original mid-century design, while beautifully updating the look to today's modern standards. 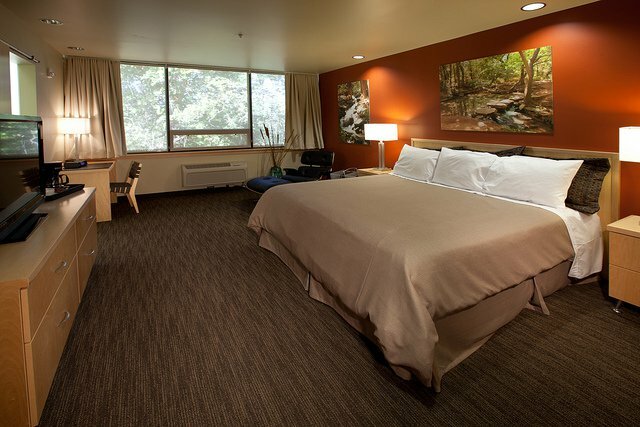 The newly decorated rooms feature large showers, comfy beds, contemporary furnishings and large flat-screen televisions. The lodge also features several conference rooms and a restaurant that serves breakfast, lunch and dinner. Pets are not allowed in the lodge. Roman Nose State Park also offers 11 cabins. Amenities include queen-sized beds, a queen sleeper sofa in the living room, a full kitchen, microwave, coffee pot, dishes, linens and a fireplace. Two of the cabins are pet-friendly. Overlooking Lake Boecher, the Pioneer Cabin can sleep up to five people between a queen-sized sleeper sofa in the living room and a full bed and fully adjustable twin bed in the bedroom. It also comes with a fully equipped kitchen, ground-level entry shower and spacious floor plan to accommodate ADA guests. Campground facilities at Roman Nose State Park include 12 full hookup sites, 35 sites with water and electric hookups and 33 tent sites. A total of 27 campsites in the Bitter Creek, Two Lakes and Canyon Vista Campgrounds are available for online reservations, while all other sites are first come, first served. From April through October, book one of the park’s teepees for a unique overnight stay. These spacious structures can sleep up to four adults and include an indoor electric outlet an outdoor fire ring and grill. For larger groups, book the Turkey Roost Group Camp. 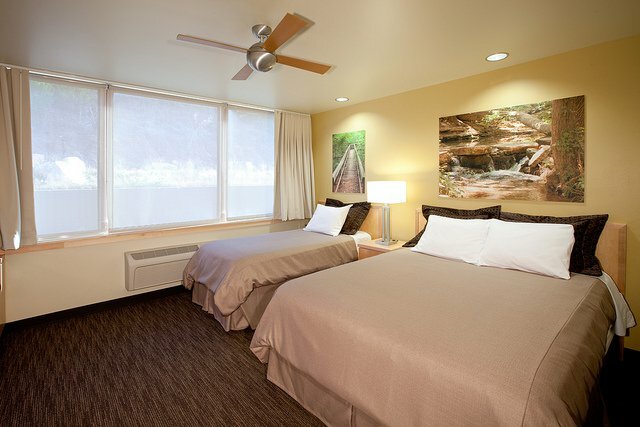 This private area offers a dining hall and A-frame bunkhouses that can accommodate up to 163 overnight guests. Also located within the park is the Roman Nose State Park Golf Course. This 18-hole, par 70 course offers sloping bent grass greens, Bermuda grass tees and fairways, natural hazards, lake views, canyon walls and mesas. Facilities include a putting green and pro shop with cart and club rentals, snacks and drinks. Book a tee time online with the booking link provided. View the rate sheet for this golf course by clicking on "View Roman Nose Golf Course Rates" link under "Maps & Resources" above. Please note that Roman Nose State Park Golf Course does not sell beer, although golf course customers are welcome to bring their own alcoholic beverages as long as they are not in a glass container. In addition, personal coolers must be of a size that only allows a maximum of 12 cans and should be able to fit discreetly in the baskets provided. For added convenience, the golf course pro-shop has coolers available for you to borrow while you are a guest at the course. Coolers may not be removed and must be returned after use.